The last few years have been great for fans of hair/glam/sleaze/pop metal (whatever you want to call it). Some of the veteran acts have renewed focus and energy and what’s just as good is that there’s tons of young bands out there that are making a mark for themselves in the genre. The Australia-based Hansel is one of those bands and what a mark it is! I can’t stop playing this one. Many newer acts rely heavily on sleaze and a punk attitude, but Hansel embraces glam and has a kooky image to boot that brings to mind Steel Panther. Don’t worry though, this isn’t a “comedy” album. Some of the lyrics purposefully steer into the many cliches of ’80s hair metal (“1-800-Pleasuretown”), but it’s all done as an homage to the past and isn’t just the setup for a punchline later in the song. In the vocal department, Jett Jones definitely delivers. At some points, he reminds me of Great White’s Jack Russell. I can’t say this is a total throwback to the ’80s. The influences are definitely there (Motley Crue, Poison, Van Halen, Guns N Roses, etc) and this is good time rock ‘n’ roll, but I wouldn’t dare call this a retro album. It’s old school with a mix of new coming close to bands like The Last Vegas, Charm City Devils, Wig Wam and Buckcherry and the better moments from Endeverafter’s Kiss Or Kill. Hansel would be right at home onstage at Cruefest (one of rock’s premier & essential concert attractions, IMO). My favorite track is probably the opener “I Don’t Need Saving (All I Need Is Rock ‘n’ Roll)”. Other faves are “Eruption” and “Murder 101” which are really catchy numbers and the acoustic “The Whole Nine Yards” which seems to be a nod to Guns N’ Roses’ GN’R Lies album. 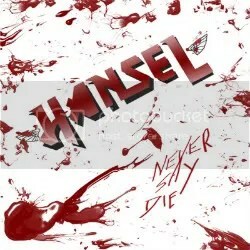 Don’t let their purposefully cheesy ’80s rocker outfits fool you — Hansel are the real rock ‘n’ roll deal.